Are you fed up of the daily routine that involves rising early in the morning and rushing to work with half-digested breakfast? If your answer is affirmative, I recommend that you retire early. Thanks to banks and financial institutions, early retirement is now possible, provided you have enough money. Understandably, there can be no upper limits about the funds you need for retirement: it varies from every individual. Here I will guide you step by step on how to retire early and yet enjoy a good, healthy lifestyle without nibbling gradually upon your savings and hard earned money. Yea, keep tabs on your spending habits and patterns even while you are working. Keeping an account of your spend will provide a near astute picture of how much money you may need upon retirement from active life early. Additionally, keeping tabs also helps you learn about any excessive and unnecessary expenses you incur currently. Curbing these expenses helps augment the amount you are already saving. Some expenses are inevitable but others can be avoided or curbed without losing your current lifestyle. Most of us falsely believe that we are saving sufficient money. Some will aver, they are depriving themselves to save. Understandable. However, there is always sufficient scope to boost your saving by taking some simple steps. Firstly, get rid of as many mortgage and credit you hold by stepping up repayment. Remember, mortgages and credit comes with a large tag of interest. Upping your repayment helps save on interest rate and provides you excellent credit ratings. Rather than viewing these higher installments as a burden on income, view them as forced savings: they will help you save sufficient money you would otherwise have paid as interest, related charges and taxes. It is best to start right now. Scout the list of cities or places where you can retire. A list of the best places to retire is released by various sources annually. Shortlist cities or places where you wish to retire early and do an online study about the cost of living there. You need to consider cost of housing, food, healthcare, local transport and other necessities at destination. Loads of such information is easily available online from various sources. Also, check amenities available at the location where you wish to retire early. Ensure these places have adequate healthcare facilities and are easily accessible from any place. Indubitably, you will already be saving and investing money for regular retirement. However, early retirement entails you step up your savings, Furthermore it also demands you make proper investments. I recommend you begin with a great retirement plan. Opt for plans that pay out pensions once you complete a fixed number of premium payments. Means, even if you retire at 40, the plan ensures you get regular monthly income. Scan the market for best available plans that offer early retirement benefits. I also suggest you invest in a good healthcare policy. The earlier you buy medical cover, the lower your premium, As years pass, your healthcare policy will cover almost every medical problem you can encounter after early retirement. Buy a family plan to cover spouse. When I say buy a retirement home, it need not necessarily be the house you wish to spend years after retiring early. Getting mortgage for a second home is easier when younger. With property prices soaring annually, a house at your early retirement destination can become unaffordable in coming years. Hence, it is advisable to buy one now. Mortgage you pay now is your savings for an early retirement. The same house can be sold to other parties at much higher price to buy your dream early retirement home. As I said earlier, find attractive schemes that make your money work. Consult your financial advisor should you have one. Divide your investment into low, medium and high risk segments. For early retirement, these investments are extremely important: they ensure your financial stability once you are no longer engaged in active work. You may consider government bonds, stocks or equities, mutual funds, time deposits, recurring deposits and various schemes. Understandably, you may not have adequate funds to spread out investments, However, you can easily create a diverse portfolio of investments with your existing savings. Plough back interest and earnings from these sources back into the financial markets. All of us are passionate about our hobbies. And they can help you earn decent income upon early retirement. Understandably, you will not be resting round the clock. Instead, you can effectively utilize the extra hours at hand to follow your passion or profession and earn a tidy buck post early retirement. Spending some hours daily teaching your passion or providing your skills to others is a great way to earn after retiring early. Such work can be easily done online or at classroom. You can also look for jobs as part-time consultants in area of your expertise. Such work helps you avoid an otherwise sedentary lifestyle. Other than keeping you gainfully engaged, it helps avoid boredom and monotony while enriching your social life. Perhaps you are unaware: there are different ways to save taxes once you retire from active service. Generally, taxation varies in each state. Here I recommend you meet a tax advisor or consultant to learn more about retirement benefits that are available once you retire early. There are various tax brackets for single and married people that retire early. Additionally, some investments you plough into government schemes also provide tax benefits. Details about these will definitely be available from your financial advisor or even the taxman. If you decide to retire early, be prepared to make some lifestyle changes. Obviously, you will have to adapt to the new place upon relocation. Additionally, there will be more spare time at hand than while working or active. Life after early retirement can become fairly boring or humdrum. Prepare for lifestyle changes by implementing various new activities in your existing patterns. Thus, any lifestyle changes will not come as shock. Nor will you require any drastic rescheduling of activities to fit in at the new place. When possible, visit the retirement destination for a few days. This hastens acclimatizing to a new place. You will also learn about various amenities and services at your early retirement location. Yes, I am indeed serious while suggesting retiring early and relocating to a foreign country. Nowadays, several countries in South America and Asia offer excellent facilities for persons that retire early. When you retire early and settle abroad, it is possible to benefit from exchange rates of the American Dollar to the local currency at destination. Perhaps you are unaware but several countries are fast emerging as early retirement destination of choice. They have excellent healthcare systems that can be accessed at a faction of cost you would pay in USA. Also, amenities in these countries compare fairly well with those back home. They allow you to own real estate and open small business or work on side jobs for extra income. Houses for retiring early are available cheap. 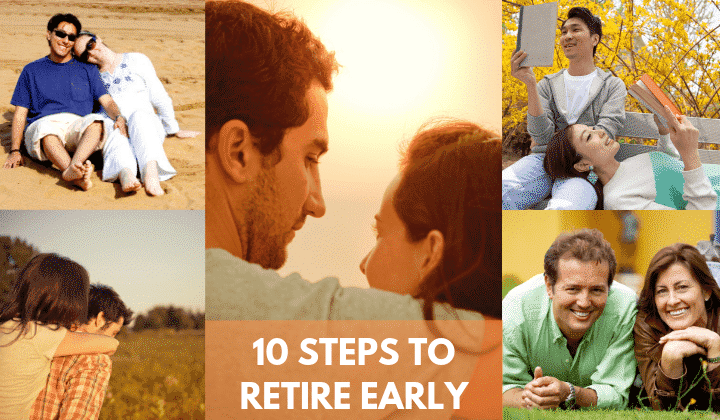 Indubitably, early retirement is something most of us look forward to. You can lead a dream life upon retiring early provided you are very careful about money and take proper steps to choose an excellent destination. Remember, early retirement means you will break away from the current routine. Therefore, money will matter a lot. Homesickness and loneliness sometimes haunts people that retire early and relocate elsewhere. The steps I have highlighted can help prevent both. Housing, food and healthcare are major expenses for any retiree. The same are valid for folks that retire early. Hence, being prepared to meet these basic expenses while leading a comfortable life are key to enjoying life after early retirement. They can be easily achieved with excellent thought and planning.